Placement of a medicament / non medicated material on a pulp that has been exposed in course of excavating the last portions of deep dentinal caries. Direct Pulp capping is done mostly when there is accidental exposure of Pulp either by any Trauma or by accidental exposure by the dentist. Small mechanical exposure surrounded by sound dentin in asymptomatic vital primary teeth / young permanent teeth. Exposure should have bright red hemorrhage that is easily controlled by dry cotton pellets with minimal pressure. 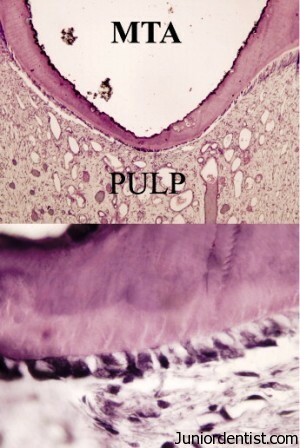 The Pulp exposure should be <0.5 mm in diameter. When there is minimal exposure of the Pulp which is asymptomatic and Vital Direct pulp capping should be done. The Tooth affected is Anesthetised wither by a Local infiltration or a Nerve block. The tooth is then isolated by a Rubber dam. If the etiology was any carious lesion make sure that you have removed all the remaining carious dentin which should not extend into the pulp chamber. With the help of proper appliances make the cavity completely dry, do not use an Air Spray as the pulp chamber is open and can enforce air bubbles into the pulp which can later lead to severe pain.Use properly sterilized cotton pellets instead. After properly drying the cavity, place the selected restoration material and seal the cavity. The commonly used materials are MTA, CaOH which are used as Base materials to seal the pulp exposure. The remaining cavity is filled with Any permanent restoration. Either Amalgam or GIC. After the Restoration is done, the patient is recalled after 8 weeks and a Radiograph is taken to access the formation of Dentin Bridge.